while not breaking the bank. 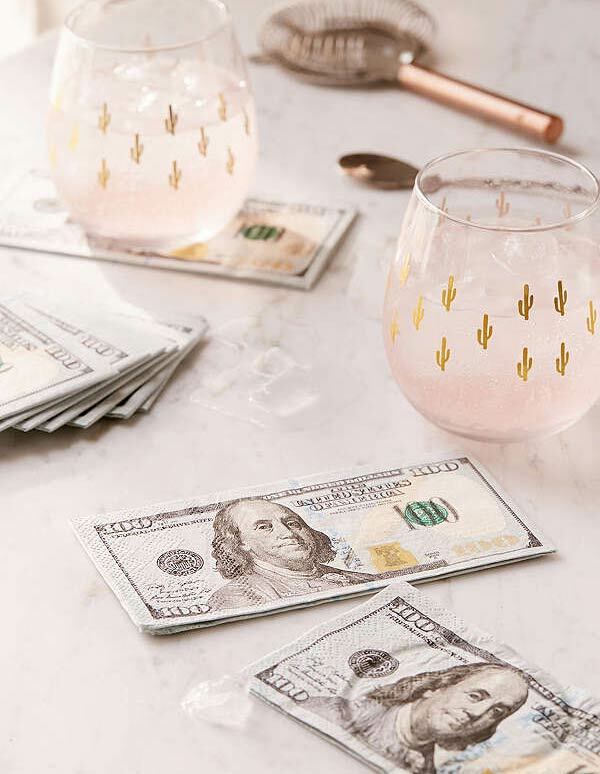 These napkins will make an extravagant addition to any party or gathering. Easily control your portion sizes with Meal Measure by measure your meal portions using USDA serving sizes. Whether you’re trying to lose weight, gain or just maintain the body you have, you should be aware of how much food you’re consuming and this simple tool will assist you by measuring your food right on your plate. You might not be loaded enough to use some Benjamins as toilet paper, but with this authentic looking 100 bill toilet roll you can pretend that your tush is worth more than some cheap grocery store toilet paper, without the guilt of having to hand-wash your money afterwards. Even if you’re broke as dirt, with these, you can pretend and impress friends and family with your phony wealth by using it as fire starters. Because there’s no better way to demonstrate to people that you’re ballin’ than by burning wads of cash. This wallet isn’t for those that are trying to save money; a wallet that looks like a hundred dollars will most likely make you lose your money rather than keep it. This wallet will also make anyone look pimpy when they take it out to buy some tacos. If you ever needed motivation to bathe yourself, this is it. You’ll be soaping up like there’s no tomorrow with these translucent soap bars that have bills at their center. They either contain a $1, $5, $10, $20, or even a $100 bill. Now that’s good clean money. The Ben Franklin money mat pool float will make you feel like you’re swimming on money. It’s spacious, comfy and everyone is sure to love a pool float made out of hundred dollar bills.